When cities grow larger, productivity per person increases. When companies grow larger, productivity per person decreases. Cities can last thousands of years and survive plagues and nuclear blasts. Large companies have an average lifespan of fifteen years, and the lifespan is dropping. It is blindingly obvious, except almost nobody noticed until a couple of years ago: Companies have short lifespans. Cities live thousands of years; Cities can survive plagues and nuclear bombs. Companies croak when there is a slight downturn in the economy. ; People want to live in large cities, but they want to work in small companies. Why? What is the difference, and does it matter? If we understand why cities are so resilient, can we use that knowledge to build better companies? Companies that are more resilient and better places to work? It turns out we can. Physicist Geoffrey West has studied cities and found a very simple mathematical relationship between city size and productivity: When a city doubles in size, each person in the city becomes about 15-20% more productive. The productivity increase in cities is in stark contrast to what happens in companies. According to an article in the CYBAEA Journal, when a company grows, productivity per employee drops. When cities grow larger, productivity per person increases by about 15% each time the city population doubles. In a company, productivity per person drops when the company grows. The fundamental difference: Cities are networks, most companies are hierarchies. What this graph shows is that a city is much better organized than the average company. But why? Cities are networks. They are to a large extent self-organizing. Nobody tells you where to live, where to shop, which friends to spend time with, or where to work, or whom to vote for. You figure all that out for yourself, based on the knowledge you have about the city. Companies are very different: You are told where to sit, what to work on, whom to work with, when to take a break, and who your boss is. You have comparatively little latitude to exercise your own judgement. Company leaders usually focus on the low end of the Meadows scale: They set targets like "increase sales by 20%", or "reduce costs by 10%". They make budgets and set project deadlines, which is saying they allocate money and time buffers. Sometimes they make a reorganization, which means they mostly mess around with stock and flow structures. Cities leave most of that to its inhabitants. City planners are concerned with overall system structure, but they mostly let people make their own decisions, and that is what makes cities resilient, productive, and powerful. 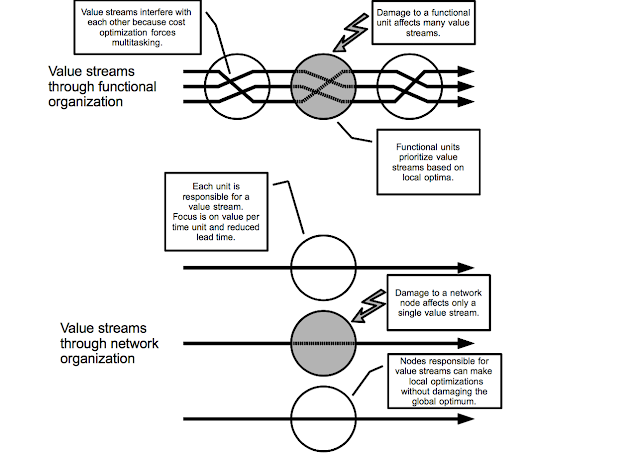 Value streams in functional hierarchies vs. value streams in networks. From my book Tempo!. Why are companies so much more vulnerable to damage than cities? There are several reasons, but most have to do with the way companies split in order to manage growth. Companies divide into functional departments. This causes problems when information or physical material is moved from one department to another. Hand-offs are difficult to manage, and you can have many value streams that interfere with each other. this problem becomes worse the more cost effective an organization is, because increasing cost effectiveness means reducing the capability to absorb variation in the value streams. 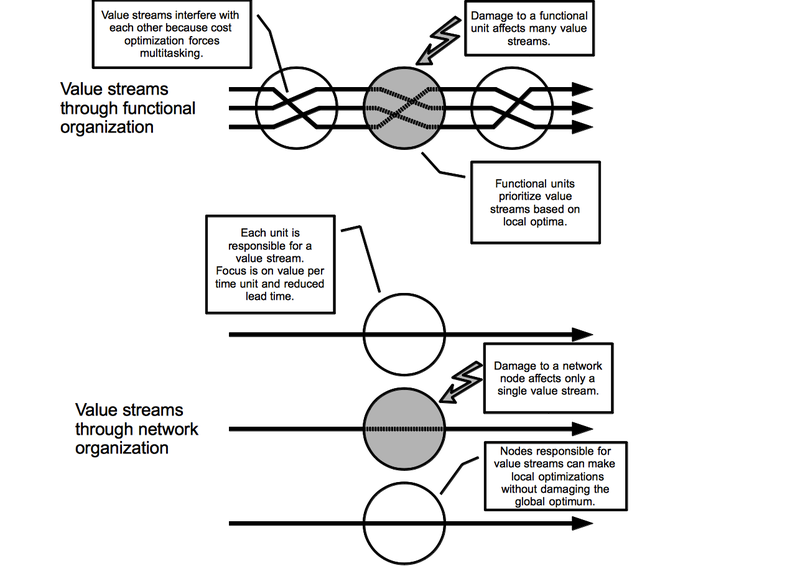 Add to that, that if a single node in a functional organization is damaged in some way, it may affect all value streams running through that organization. For example, if the IT department suffers from work overload, you can't do anything but wait until they get to your request. I have worked at companies with waiting times of 9-18 months for simple requests like setting up a server. On the other hand, in a city, if you can't get the service you want when you want it, you go someplace else. If the grocery shop closest to where I live closes, I won't starve. I just shop my food somewhere else. According to the book Creative Destruction by Richard Foster, the lifespan of large companies is shrinking steadily. 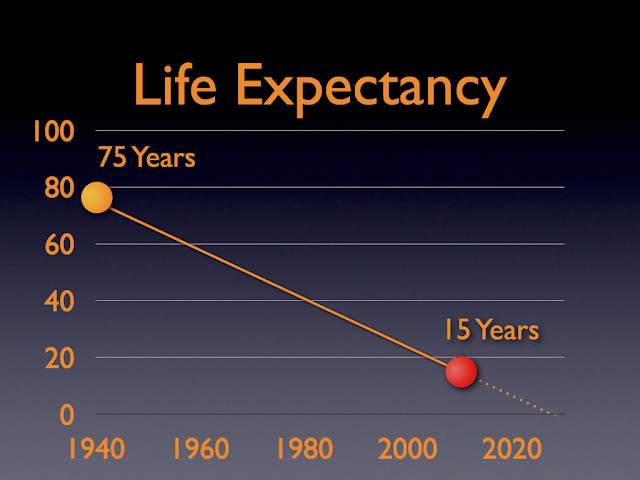 In 1938 the lifespan was about 75 years. In 2010 it was about 15 years. It is when you link the productivity figures with company Return On Invested Capital and life expectancy numbers that the results get really scary. According to the 2010 Shift Index by Deloitte, ROIC has dropped from 6.5% in 1965 to 1.3% in 2010. Steve Denning has pointed out that a study by Richard Foster, using data collected by McKinsey, shows that the life expectancy of companies have been shrinking steadily. In 1938 the life expectancy of an S&P Fortune 500 company was about 75 years. In 2010 it had shrunk to about 15 years. The amazing thing is that we do have plenty of blueprints for building companies that are as resilient as cities, but with rare exceptions, we don't. There are signs that things are looking up though. We may have a phase shift, a rapid transition from the old hierarchies to network based organizations pretty soon. 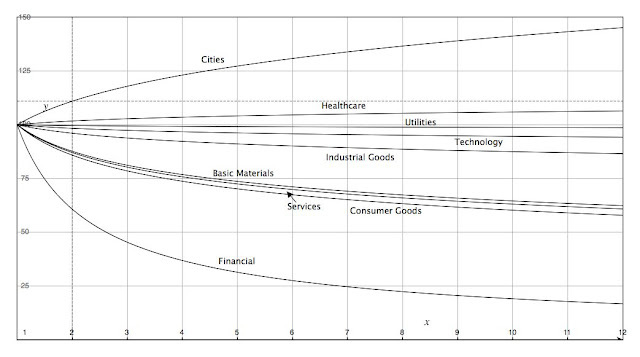 1) What is the productivity of a city? 2) Many cities have financial problems nowadays. 3) Cities are vulnerable if centralized infrastructure breaks down. One more thing: Is it really that big companies live only 15 years in average? I am not using cities as a metaphor for companies. I am using cities as an example of scale-free networks. You are quite right that there are limits to the accuracy of the examples, but they stem more from limits in our, well my, understanding of how networks and hierarchies work. 1. According to Geoffrey west, the 15% rule holds for just about any measure you want. I did not go into detail about it in the blog post, because West has plenty of examples in the TED Talk I linked to. 2. Yes. Cities are not immune to misfortune, accidents, or sheer stupidity. However, they tend to survive even severe hardships, Companies, on the other hand, are extremely vulnerable. There are examples of network based companies, like Virgin, Semco, and Gore & Associates. These are not immune to damage either, but they are much more robust than traditional companies. There are several military studies that compare how hierarchies and networks stand up against each other. The ones I have read come to the same conclusion I did in this article, even though the angle of approach is completely different. I have updated the article with examples of productivity increases in cities. 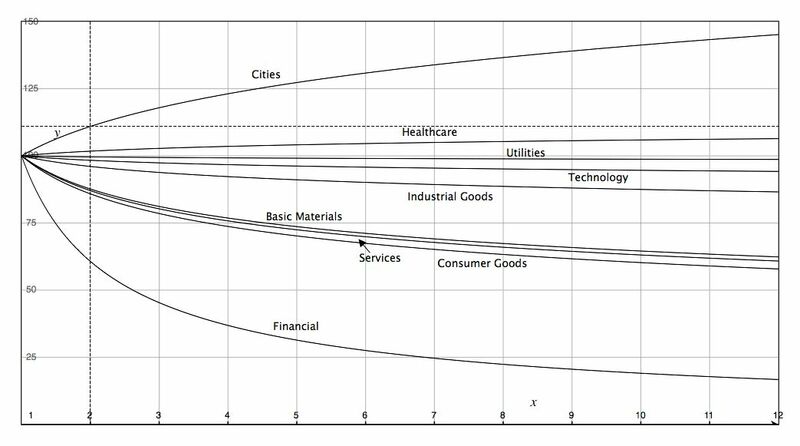 I also added a diagram showing the decreasing lifespan of cities, and where the information is coming from. Very interesting article. I've been attempting to understand the nature of hierarchies specifically within programming and programming languages with, to some extent, similar conclusions. For instance, type hierarchies, which are a principal modelling technique in object-oriented programming, are being seen as increasingly harmful and dangerous. Instead, programmers are directed to favor composition over inheritance. More recently, functional programming techniques provide new modelling paradigms which factor problems explicitly with function as opposed to implicitly with type hierarchies. Overall, I'm interested in the subject matter in general. Thank you for this article! There was a really heavy snowfall in Stockholm yesterday (2012-12-06), and of course the papers where filled with headlines "Snow chaos". However, although the infrastructure of public transport broke down (no busses or commuter trains), emergent structures arose to compensate: friends slept over, neighbours picked up kids from school and fed them etc. 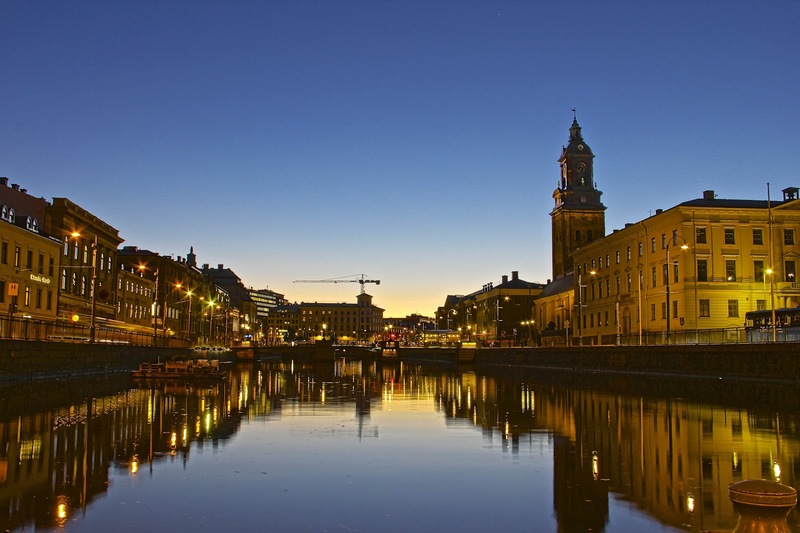 So, Stockholm as a system did not break down to chaos, but proved resilient to emerge other structures when needed. > "There are several military studies that compare how hierarchies and networks stand up against each other." There is also the wonderful book, The Starfish And Spider which describes—for many different contexts—the robustness of networks and self-organization over hierarchies. You can walk out from your job and start up in another job the day after. It is not that easy to leave your house, build another one in another city still with all your friends around you. In general, you are right about companies being beyond repair. There are a few exceptions though. sometimes you can do something for someone. We are a bit like the man throwing starfish on the beach (http://www.changeeverything.ca/blog/catherine_ludgate/it-makes-difference-one-starfish). I don't have enough data to be certain, but I believe that the main cause of death of cities is effectiveness. Cities organized around a single thing, a mine, or a harbor, is very vulnerable. City planning can kill a city off, if the planners try to make the city effective by reducing redundancy (which is sometimes the reason for planning a city in the first place). Thanks for reminding me about Antifragile! I just bought it. Looks like I'll be reading a lot this Christmas (if my family and relatives let me). I agree. The reason why you can walk out from one job, and start working somewhere else, is that the companies are part of the city ecosystem. It is often easier to transfer between companies than to transfer within a company. The reason is that if your skills are adapted to fit one specific function in the company, you won't fit anywhere else. On top of that, everyone expects you to stay the same, to not change over time. This makes it very difficult for, say, a software developer to transition into a marketing department, or a sales person to transition into the software department. What the actual skills are, what skills can be developed, or the value of simply cross-polinating between different parts of the company, is rarely given much weight. However, in network organizations, like the Virgin Group or Business Network International, you can move from one location to another quite easily. Cities don't have a purpose. They are just there to reproduce themselves like living beings while companies have an external purpose and depend on a product or service they provide. This makes a big difference from my POV. The city-large organization comparison is a good and appropriate one. There is some evidence to suggest that - in companies with over 1,000 employees - the average productivity of an employee drops by more than ¼ for each order-of-magnitude increase (Source: http://www.cybaea.net/Blogs/Data/Employee-productivity-as-function-of-number-of-workers-revisited.html). I'd note that Deloitte's Shift Index (2011 is most recent) is worth checking out for their related analysis (for example - declining Return on Assets in the US since 1965). Hej Henrik, long time no see. Thanks for a good and entertaining article. @stefanhaas : large organizations actually struggle quite a bit attempting to define a unifying purpose, vision and so on. I actually believe your observation builds upon this thought, rather than detracts from it. Smaller organizations have an easier time coming together around a purpose. I believe the only thing stopping companies from doing the same, is convention. There are attempts to fix the problem. For example, Stephen Denning, a former World Bank director, has done a lot of work constructing better models for business organisations. Perspectives - To buy or not to buy a book?